Looking for a unique gift for the end-of-the-year dance recital? Take a look at dance throw pillows. 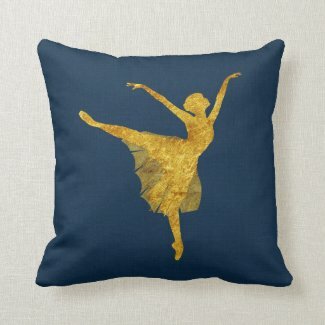 You can buy customizable dance pillows at Zazzle from a variety of designs so you can find the perfect present for your dancer or dance teacher. It’s customary to have a gift ready for both teacher and dancer at the end of the show – but if your tired of picture frames a throw pillow is a great idea. Today, we’re going to talk about how to elevate your gift and further customize a pillow by using a fabric pen, such as the Crafts 4 All Dual Tip 12 Pack Fabric Markers, that will make the memories even more special. A fabric pen is specifically designed to write on many different types of fabrics. Most pens are designed primarily to write on flat, smooth surfaces. A fabric pen takes into account a rough surface so that the writing will still have a smooth appearance. You will need to find the right fabric pen for the writing that you want to accomplish. Typical Sharpies are good, but quality fabric markers are generally the best. This is because they are felt markers which can run over rough surfaces and still smoothly deliver the ink. The most obvious challenge to using a fabric pen is having a firm surface to actually write your name or greeting on the back of the pillow without smearing or bleeding. There are a few different ways to accomplish this task with varying degrees of quality. Smash the Pillow: This is the simplest method that only requires a couple of flat boards or items that you can use to press down on the upper and lower half of the pillow creating enough space to write in-between. While the area left will still be a little bumpy, it will not have the “give” of a free-standing pillow. You will need to gently press the pillow down on a firm surface while the message is being written. Done properly, there will be no damage to the pillow itself and what is written is generally smooth. Insert a Flat Surface: If you are skilled at sewing, or you have a zippered cover, you can simply open up the pillow along the seam and insert a flat panel underneath the back layer which will allow for a message to be smoothly written. Once written you remove the panel and sew up the pillow with a similar thread color. Use a Sticker or Fabric: As an alternative, you might try using a large, blank sticker that can go across the back of the pillow. Simply write your message on the sticker first and then place it across the pillow after you are done. Alternatively, you can write on a piece of fabric which can then be sewn into the back of the pillow. This takes more work, but the good news with stickers and fabric is that if you mess up on writing the message, you can always start over without ever damaging the pillow itself. In the end, writing with a fabric pen is fairly simple. Just remember to plan out the name or message you write on the back of the pillow before you start for the best result. Your dancer or dance teacher is going to love his or her new beautiful personal dance throw pillow.